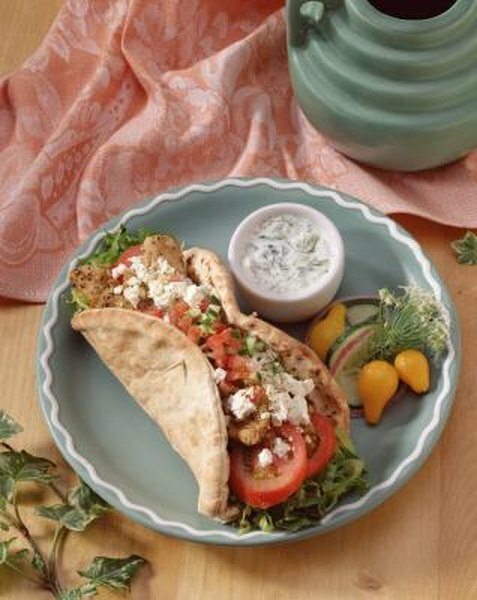 Gyros are Greek wraps made with pita bread, meat, lettuce, onion, tomato and often, tzatziki sauce, a yogurt-based topping. Gyro meat is made from lamb and is sliced into thin strips before serving. This meat is high in calories and fat, and may not be appropriate for you if you're dieting. However, gyro meat also has benefits, such as providing protein. A 4 oz. serving of gyro meat provides 178 calories. This amount is about 9 percent of the daily recommended intake of 2,000 calories. Gyro meat is higher in calories than some other types of meat, such as chicken. A 4 oz. serving of chicken breast contains 130 calories. Gyro meat is high in fat, with 11 g in each 4 oz. serving. Of this fat, 4.7 g comes from saturated fat. The USDA suggests you consume 20 percent to 35 percent of your calories from total fat, and less than 10 percent from saturated fat. Based on the 2,000 calorie diet, this would be between 44 g and 77 g of total fat and less than 22 g of saturated fat. Gyro meat, like most meat, is very low in carbohydrates. A 4 oz. serving of this meat provides 2.2g of carbohydrates. However, a complete gyro wrap is not low in carbohydrates, as a 6-inch pita contains more than 35 g of carbohydrates. Gyro meat is rich in protein. Each 4 oz. serving of this meat contains 16.2 g of protein. MedlinePlus recommends consuming 50 g to 65 g of protein every day. This means that a 4 oz. serving of gyro meat provides about 25 percent of your daily recommended protein intake. Gyro meat contains 264 mg of sodium in each 4 oz. serving, which is about 11 percent of the daily recommended intake. The Harvard School of Public Health explains that consuming too much sodium can lead to fluid retention and high blood pressure.